So sometime ago I happened to catch an episode of Pioneer Woman with Ree Drummond on Food Network where she prepared a pot roast for her family (episode: Frontier Family). What she made looked absolutely delicious and simple. It was only this past weekend when I wanted to cook a pot roast using her recipe because it was the perfect one pot dinner with minimal cleanup. I looked up the recipe on the Food Network website and read the reviews. The reviews were overwhelmingly positive for her pot roast. With close to 200 people reviewing the recipe with most of them giving it a 5 (out of 5) star rating (as of this post), how can I go wrong following the recipe? Boy was I wrong. This was kind of like false advertising: the pot roast was definitely not PERFECT as the recipe indicated. But I didn't need perfection per se...I only needed it to be good and it wasn't even that. What went wrong? I really don't know since I followed the directions exactly. How can close to 200 people be wrong? That I can't explain either, but stranger things have been known to happen. Perhaps the planets were not aligned and making the space inside my oven all out of whack. The pot roast for sure wasn't terrible. It was just really bland and tasteless. Those few reviewers who gave this recipe a bad rating said the same thing that it didn't really taste much of anything. Even worse was that I had 4 lbs of this at the end of the day. It seemed rather soupy. The pot roasts I've tasted all had thicker sauces that went with it (pot roasts from BJ's, Carrows, and IHOP) where it was nice and "saucy" and not thin and bland. I'd probably give this recipe 2 out of 5 stars on the merit that it was still edible and wasn't that awful that it couldn't have been eaten. I kind of feel like Ree Drummond's credibility has been shot with this recipe (shown below). You can go ahead and try this out for yourself, but it just didn't work out for me. If you do try it out and it comes out really good, please let me know. I'd love to hear your experience and maybe a few tips on what you did right. In the end I felt like it was a pot roast that you can find in a high school cafeteria. The simplicity of this recipe translated into simple flavors which was neither great nor awful...just plain simple and definitely far from perfect. Heat the olive oil in large pot or Dutch oven [definitely use a Dutch oven as one reader noted in a comment below] over medium-high heat. Add the halved onions to the pot, browning them on both sides. Remove the onions to a plate. Put the lid on, then roast for 3 hours for a 3 lb roast. For a 4 to 5 lb roast, plan on 4 hrs. The roast is ready when it's fall-apart tender. Oh my, I am so sorry you had this experience. 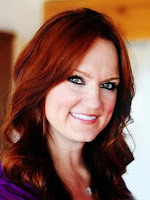 I'd like to refer you to The Marlboro Woman website where Ree Drummond's little ol' ranch wife schtick a/k/a The Pioneer Woman has been exposed as nothing more than an Internet hoax that's making Drummond and her media team wealthy. The reason you saw predominantly positive comments is because Food Network sanitizes remarks and people who post a less than complimentary critique are simply deleted. The exact same scenario plays out on Drummond's blog every day. Examine the comments for yourself; Drummond's censors keep it squeaky clean. As for her recipes, Drummond lifts many of them from church and community cookbooks, tweaks an ingredient here or there and publishes it as her own work. Rarely does she credit her hometown's service league or churches. I don't know about you, but in my book that's plagiarism. And unless you're into retro, Betty Crocker style recipes for burgers, brownies and sloppy joes, don't buy her cookbooks. With few exceptions, the recipes are available for free on her website plus you won't feel so bad when one inevitably fails. @Anonymous - Thank you for your very informative comment. I just thought I messed up the recipe and had a little bad luck since the recipe had a lot of positive reviews. Before trying a given recipe, I do read a lot of the reviews because many people offer great tips on what worked and what didn't work. I can understand some reviews being deleted: check my post on Paula Deen's English Peas recipe - www.madeinmykitchen.com/2012/06/paula-deens-english-peas.html - where silly comments that were poking fun of the recipe were indeed taken down, but it's disconcerting that some real comments were deleted only because they gave negative reviews in other cases. I enjoy watching FN (I like Barefoot Contessa's Ina Garten and the Neely's), but there was always something off about Pioneer Woman that the show never grew on me like other shows - maybe Pioneer Woman was just too staged for me. I'll have to check out the marlborowoman blog which seems to have a lot of interesting info on Ree Drummond which I wasn't aware about. Thank you so much for the valuable resource. Hi @Nancy Muhlenkamp, thank you for commenting. I'm glad that Ree's pot roast recipe works for you and your family. Although my pot roast was indeed tender, there just wasn't enough flavor. You do bring up a good point though to use a dutch oven for this recipe. It's been awhile since I've made this, but I do remember just using a big pot instead of a dutch oven because I didn't have a dutch oven at the time. Now that I have a dutch oven, I'll have to revisit this recipe since this was a recipe I really wanted to like. It sounds like the dutch oven could mean the difference between a great pot roast and an ok one. Thank you for all your great tips! I'll definitely refer to them when I take another stab at it. Hi @Anonymous, I'm not too sure what brand dutch oven Ree Drummond uses. I have a Tramontina dutch oven which I like because it is an enameled cast iron dutch oven. The enamel coating helps prevent rust. Also, Le Creuset dutch ovens tend to be more expensive (in excess of $200) whereas Tramontina and I'm sure Lodge can be found at a reasonable price at $40-50. I hope this helps!